THE MONTANA KID (1931, Monogram) Bill Cody, Doris Hill, Andy Shuford, John Elliot. Bill and his friend await the arrival of the stage carrying the friend's young son. While they're waiting, the friend gets drunk, is swindled out of his ranch, and is eventually murdered. Bill takes care of the young boy and goes after the man responsible for the murder. Definitely one of Bill’s better Bs. From 16mm. THE GHOST CITY (1932, Monogram) Bill Cody, Andy Shuford, Helen Forest, Walter Miller, Charlie King. In an unusual twist for a B western, Bill plays a tough, sharp-shooting cowboy who also happens to be a newspaperman. He plans to start a new sheet in a frontier boomtown to expose the nefarious dealings of the town’s crooked banker. The climatic scene in a deserted mine shaft is really a blast. 16mm. FRONTIER DAYS (1934, Spectrum) Bill Cody, Ada Ince, Wheeler Oakman, Billy Jr., Lafe McKee. A beautiful upgrade of what is probably Cody's best film. Bill’s a lawdog tracking down a gang responsible for hold-ups and murders. He's framed for murder himself! In a great scene, he has Ada Ince turn him in so she can collect the reward money to pay off her debt to crooked banker Oakman. Some fabulous Lone Pine footage. Highly recommended. From 16mm. 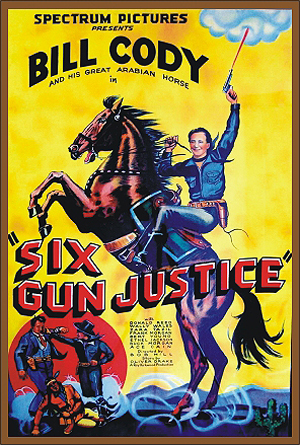 SIX-GUN JUSTICE (1935, Spectrum) Bill Cody, Wally Wales, Zara Tazil. We’re continually impressed with the quality of Cody’s Spectrum series. In this one, Bill is a road agent who has broken from Wales’ gang and hidden their holdup loot. After being snared by Wales, Bill is saved by a deputy who seizes the stolen loot. The deputy is captured, though. Watch as Wally gleefully sits and carves wooden pine shafts to be shoved under the deputy’s toenails and lit on fire! Great fun. From 16mm.